We can fill all your remodelling requirements for bathtubs, tiles, countertops, and other refinishing upgrades and repair. 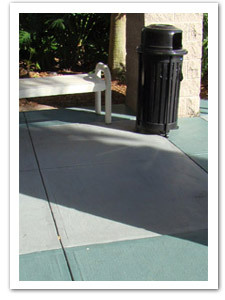 Chip and crack repair to complete upgrade remodelling, Superior Surface Refinishing has the solutions for you and at a fraction of the cost of replacement renovations. Call us and we will be more than happy to discuss how we can best fit into your upgrade and maintenance programs. We can even do refinishing in occupied suites with the least amount of disruption possible. You know better than anyone that apartments or rental properties with clean, modern kitchens and baths, rent faster and for more money! 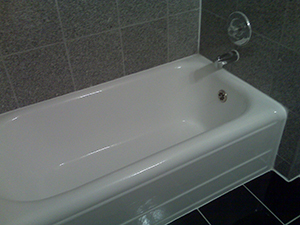 This old antique cast iron tub was refinished in brilliant white as part of an apartment to condominium renovation. The entire bathroom was renovated and now this beautiful antique tub blends in with the new ceramic tile and other modern fixtures. See our Gallery Section for more Bathroom and Kitchen Pictures of our refinishing work, and contact us today.